Lighting Up Central Maine Since 2003. Since 2003, Wire Guys Electric has been providing a full scope of electrical services to residential and commercial customers in the Oakland, ME area. Our trusted experts are here to deliver professional services you can count on, on-time, and within budget. There’s no job too small or too large for us to tackle! Our customers feel confident in their decision to hire Wire Guys Electric because we are licensed and insured professional electricians with many years of experience in the electrical industry. Our company has a reputation for quality work and setting high standards of workmanship which have become the foundation of our company. Our electricians are experienced, professional, and personable. Whether we’re completely rewiring your home, camp, cottage, or office, or simply installing a ceiling fan, we’re prompt, courteous and always leave the facilities the way we found them. Finding a trusted, experienced electrician in Oakland, ME doesn’t have to be hard. In fact, all it takes is a call to Wire Guys Electric! No matter what type of electrical problem you’re looking at—residential or commercial in nature—there’s a good chance we’re able to solve it. We’ve been providing a huge range of electrical services to customers for decades and in that time, we’ve developed a reputation for safety, thoroughness, and honesty. Our services span the gamut of general electrical contracting, including work on interior and exterior lighting, new construction wiring, generator installation, hot tub and swimming pool wiring, electrical troubleshooting, ceiling fan installation, security lighting, electrical remodeling, and LED lighting upgrades, among others. 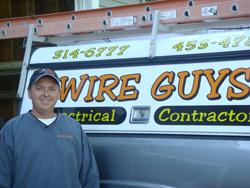 Wire Guys Electric is owned and operated by Todd Noel, a second generation Master Electrician who has lived in Central Maine his whole life. Todd provides both commercial and residential wiring throughout the Central Maine area. As an experienced commercial and residential electrician in Oakland, ME, Todd makes it a point to treat every customer with the respect and honesty they deserve. When he shows up on site for your project, he comes ready to work. He’ll make sure you’re getting the steadfast service you demand to complete every project to the highest quality standards. He won’t leave a site until the job is done fully and completely! Whether you’ve got a small fixture installation project or you’re looking for someone to tackle a major rewiring project, make the call to Wire Guys Electric and see what an expert professional brings to the table. We’ve been providing residential and commercial electrical services to Central Maine for more than 20 years! We take pride in providing reliable service that keeps your project on-time and within budget. 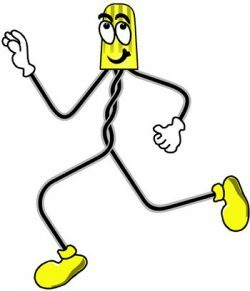 Our business is an Efficiency Maine Qualified Partner and we’re owned/operated by a licensed Master Electrician. Our full scope of service capabilities applies to both indoor and outdoor electrical projects. Contact us for a free quote on your next electrical project! From basic in-home repair to complex new commercial installations, Wire Guys Electric is here to assist with all your electrical needs. Contact us today to get a free estimate on your project.